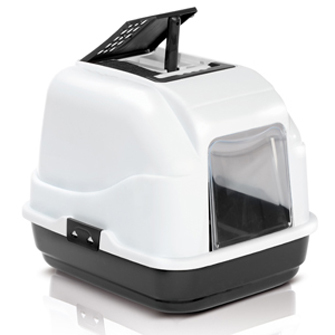 Imac Easy Cat Loo is a high quality, modern cat litter tray that includes a hood, door, scoop and carbon filter. The carbon filter cleverly prevent odours from escaping the Imac Easy Cat Loo. It is available from VioVet in assorted colours. Below are some recent questions we've received regarding Imac Easy Cat Loo, including answers from our team. what are the dimensions of this litter box?